Synthetic peptide within Human Smac/ Diablo (C terminal). The exact sequence is proprietary. ab32023 reacts with an epitope located in the C terminal region of Smac / Diablo. WB: Jurkat whole cell lysate (ab7899). IHC-P: Human skin cancer tissue. ICC/IF: HeLa cells. Our Abpromise guarantee covers the use of ab32023 in the following tested applications. WB 1/1000. Detects a band of approximately 21 kDa (predicted molecular weight: 27 kDa). Promotes apoptosis by activating caspases in the cytochrome c/Apaf-1/caspase-9 pathway. Acts by opposing the inhibitory activity of inhibitor of apoptosis proteins (IAP). Ubiquitously expressed with highest expression in testis. Expression is also high in heart, liver, kidney, spleen, prostate and ovary. Low in brain, lung, thymus and peripheral blood leukocytes. The mature N-terminus mediates interaction with XIAP. Mitochondrion. Released into the cytosol when cells undergo apoptosis. Immunocytochemistry/Immunofluorescence analysis of HeLa cells labelling Smac / Diablo with ab32023 at 1/500. Cells were fixed with 100% methanol. 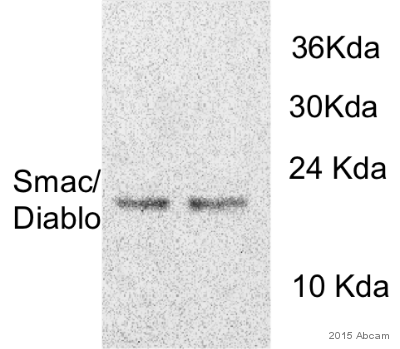 ab150077, an Alexa Fluor® 488-conjugated goat anti-rabbit IgG (1/1000) was used as the secondary antibody. Immunofluorescence analysis of IMR32 cells, staining Smac / Diablo with ab32023. Cells were fixed with 4% paraformaldehyde before incubating with primary antibody. 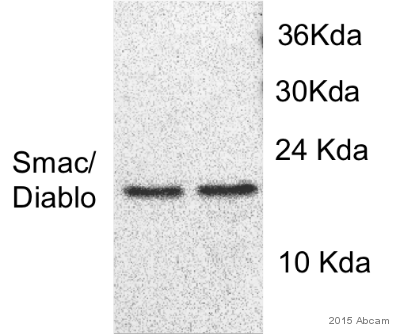 An Alexa Fluor® conjugated anti-rabbit IgG was used as the secondary antibody. Publishing research using ab32023? Please let us know so that we can cite the reference in this datasheet. https://www.abcam.com/index.html?datasheet=98502 (or use the following: https://www.abcam.com/index.html?datasheet=98502). https://www.abcam.com/index.html?datasheet=98466 (or use the following: https://www.abcam.com/index.html?datasheet=98466). https://www.abcam.com/index.html?datasheet=97070 (or use the following: https://www.abcam.com/index.html?datasheet=97070). https://www.abcam.com/index.html?datasheet=98494 (or use the following: https://www.abcam.com/index.html?datasheet=98494).